Worksheets may be printed and reproduced free of charge by teachers, parents and students for classroom or homework usage. It is also acceptable to link to this page on other websites and in emails using the title above and the following URL: http://internet4classrooms.com/printables/common_core/math_mathematics_3rd_third_grade/description_download_10821-CCSS.Math.Content.3.MD.A.1.htm or simply: http://i4c.xyz/y9a57hm9. This image and data thereon may not be sold, published online or in print by anyone else. 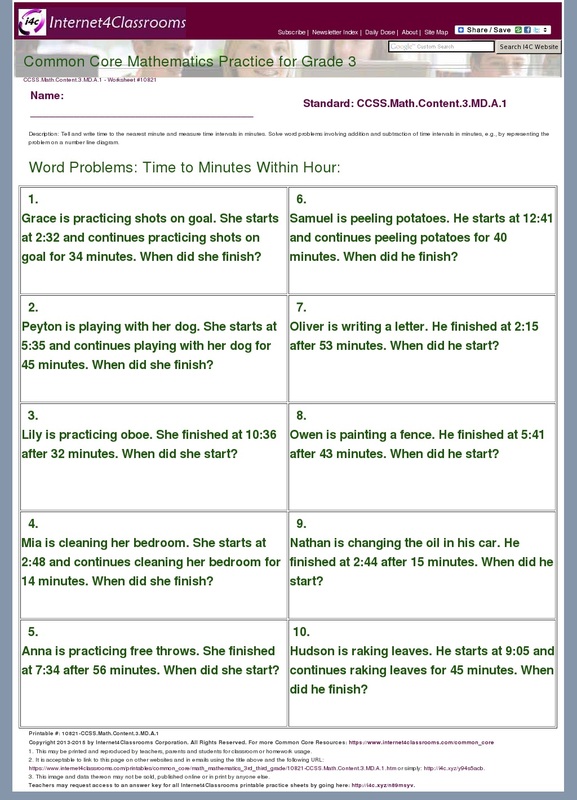 The answer key corresponding to this worksheet may be found here: http://i4c.xyz/y8atf6pz. Teachers may request access to an answer key for all Internet4Classrooms printable practice sheets by going here: http://i4c.xyz/n89msyv. 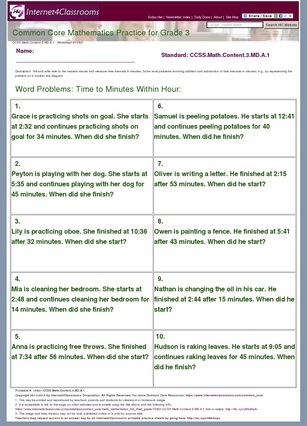 Problem Type: Word Problems: Time to Minutes Within Hour. Tell and write time to the nearest minute and measure time intervals in minutes. Solve word problems involving addition and subtraction of time intervals in minutes, e.g., by representing the problem on a number line diagram. Publisher: National Governors Association Center for Best Practices, Council of Chief State School Officers, Washington D.C.
Internet4classrooms is a collaborative effort by Susan Brooks and Bill Byles. Copyright © 2000-2019 Internet4Classrooms, LLC All rights reserved.